"Sigismund II" redirects here. For the Prince of Anhalt-Dessau, see Sigismund II, Prince of Anhalt-Dessau. Sigismund II Augustus (Polish: Zygmunt II August, Lithuanian: Žygimantas II Augustas, German: Sigismund II. August; 1 August 1520 – 7 July 1572) was the King of Poland and Grand Duke of Lithuania, the only son of Sigismund I the Old, whom Sigismund II succeeded in 1548. Sigismund was the only legitimate son of Italian-born Bona Sforza and Sigismund the Old. From the beginning he was groomed and extensively educated as a successor. 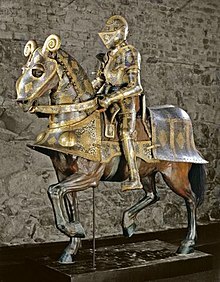 In 1529 he was crowned vivente rege while his father was still alive. Sigismund Augustus continued a tolerance policy towards minorities and maintained peaceful relations with neighbouring countries, with the exception of the Northern Seven Years' War which aimed to secure Baltic trade. Under his patronage the culture flourished in Poland; he was a collector of tapestries from the Low Countries and collected military memorabilia as well as swords and armours. Sigismund Augustus' rule is widely considered as the apex of the Polish Golden Age. In 1569 he oversaw the signing of the Union of Lublin between Poland and the Grand Duchy of Lithuania, which formed the Polish-Lithuanian Commonwealth and introduced an elective monarchy. Sigismund Augustus married three times; his first wife, Elizabeth of Austria, died in 1545 at just eighteen. He was then involved in several relationships with mistresses, the most famous being Barbara Radziwiłł, who became Sigismund's second wife and Queen of Poland in spite of his mother's disapproval. The marriage was deemed scandalous and was fiercely opposed by the royal court and the nobility. Barbara died five months after her coronation, presumably due to ill health, however, rumours circulated that she was poisoned. Sigismund finally wedded Catherine of Austria, but remained childless throughout his life. Sigismund Augustus was last male member of the Jagiellons. Following the death of his sister Anna in 1596 the Jagiellonian Dynasty came to an end. Royal titles, in Latin: "Sigismundus Augustus, Dei gratia rex Poloniae, magnus dux Lithuaniae, nec non terrarum Cracoviae, Sandomiriae, Siradiae, Lanciciae, Cuiaviae, Kiioviae, dominus hereditarius Russiae, Woliniae, Prussiae, Masoviae, Podlachiae, Culmensis, Elbingensis, Pomeraniae, Samogitiae, Livoniae etc. dominus et heres." English translation: "Sigismund Augustus, by the Grace of God, King of Poland, Grand Duke of Lithuania, Lord and heir of the Lands of Kraków, Sandomierz, Sieradz, Łęczyca, Kuyavia, Kiev, Hereditary Lord of Ruthenia, Volhynia, Prussia, Masovia, Podlaskie, Culmer Land, Elbing, Pomerania, Samogitia, Livonia etc. Lord and heir"
From the outset of his reign, Sigismund came into collision with the country's nobility, who had already begun curtailing the power of the great families. The ostensible cause of the nobility's animosity to the King was his second marriage, secretly contracted before his accession to the throne, with the (said to be beautiful) Lithuanian Calvinist, Barbara Radziwiłł, daughter of Hetman Jerzy Radziwiłł. So violent was the agitation at Sigismund's first sejm (31 October 1548) that the deputies threatened to renounce their allegiance unless the King repudiated his wife Barbara. He refused and won the day. By 1550, when Sigismund summoned his second sejm, a reaction had begun in his favor, and the nobility was rebuked by Piotr Kmita, Marshal of the sejm, who accused them of attempting to unduly diminish the legislative prerogatives of the crown. The death of Queen Barbara, five months after her coronation (7 December 1550), under distressing circumstances, compelled Sigismund to contract a third, purely political union with his first cousin, the Austrian archduchess Catherine, also the sister of his first wife, Elisabeth, who had died within a year of her marriage to him, before his accession. Sigismund soon lost all hope of children by his third bride; he was the last male Jagiellon in the direct line so the dynasty was threatened with extinction. He sought to remedy this by adultery with two of the most beautiful of his countrywomen, Barbara Giżanka and Anna Zajączkowska but was unable to impregnate either of them. The sejm was willing to legitimize, and acknowledge as Sigismund's successor, any male heir who might be born to him; however, the King was to die childless. The King's marriage was a matter of great political import to Protestants and Catholics alike. The Polish Protestants hoped that he would divorce and remarry and thus bring about a breach with Rome at the very crisis of the religious struggle in Poland. He was not free to remarry until Queen Catherine's death on 28 February 1572, but he followed her to the grave less than six months later. Sigismund's reign was a period of internal turmoil and external expansion. He saw the introduction of the Protestant Reformation into Poland and Lithuania, and the peero-cratic upheaval that placed most political power in the hands of the szlachta (nobility); he saw the collapse of the Knights of the Sword in the north, which led to the Commonwealth's acquisition of Livonia as a Lutheran duchy and the consolidation of Turkey's power in the south. A less imposing figure than his father, the elegant and refined Sigismund II Augustus was nevertheless an even more effective statesman than the stern and majestic Sigismund I the Old. Sigismund II mediated for twenty years between the Catholic Church and the Protestants. His most striking memorial may have been the Union of Lublin, which united Poland and Lithuania into the Polish–Lithuanian Commonwealth—the "Republic of the Two Nations" (Polish: Rzeczpospolita Obojga Narodów, Lithuanian: Abiejų Tautų Respublika). Also, German-speaking Royal Prussia and Prussian cities were included. This achievement might well have been impossible without Sigismund. Sigismund died at his beloved Knyszyn on 6 July 1572, aged 51. In 1573, Henry III of Valois was elected King of the Polish–Lithuanian Commonwealth for a few months, but then returned to France where he was crowned King Henry III of France. Shortly thereafter, Sigismund's sister Anna of Poland married Stefan Batory, and they ruled as King and Queen of Poland. In addition to his family connections, Sigismund II was allied to the Imperial Habsburgs by his pledge as member of the Order of the Golden Fleece. Young Sigismund is one of the figures on the Prussian Homage painting by Jan Matejko. Sigismund Augustus carried on with the development of several royal residencies including Wawel Castle, Vilnius Castle, Niepołomice Castle and the Royal Castle in Warsaw. In the 1560s he acquired the Tykocin Castle and rebuilt it in Renaissance style. During the reign of Sigismund Augustus the structure served as a royal residence with an impressive treasury and library as well as the main arsenal of the crown. Sigismund Augustus was a passionate collector of jewels. According to nuncio Bernardo Bongiovanni's relation, his collection was cached in 16 chests. Among the precious items in his possession was Charles V's ruby of 80,000 scudos' worth, as well as the Emperor's diamond medal with Habsburgs Eagle on one side and two columns with a sign Plus Ultra on the other side. In 1571, after the death of his nephew John Sigismund Zápolya, he inherited an Hungarian Crown and a Swedish Crown was made for him. The Polish king treated those crowns as a family keepsake, and kept them in a private vault in the Tykocin Castle. He had also a sultan's sword of 16,000 ducats' worth, 30 precious horse trappings and 20 different private-use armours. The king's possession included a rich collection of tapestries (360 pieces), commissioned by him in Brussels in the years 1550–1560. On 5 May 1543, Sigismund married his first wife Elisabeth of Austria (9 July 1526 – 15 June 1545), eldest daughter of Ferdinand I, Holy Roman Emperor and Anna of Bohemia and Hungary. In 1546, he was pursuing marriage with Mary Tudor, daughter of Henry VIII of England and then the noblewoman Katherine Willoughby, Duchess of Suffolk. Between 28 July and 6 August 1547, Sigismund married his second wife Barbara Radziwiłł (6 December 1520 – 8 May 1551). In the summer of 1553, Sigismund married Catherine of Austria (15 September 1533 – 28 February 1572), a younger sister of his first wife. One or more of the preceding sentences incorporates text from a publication now in the public domain: Bain, Robert Nisbet (1911). "Sigismund II.". In Chisholm, Hugh (ed.). Encyclopædia Britannica. 25 (11th ed.). Cambridge University Press. p. 68. ^ Museum in Białystok (1991). "Volume 16". Rocznik białostocki (The Annual of Białystok). Polish Scientific Publishers PWN. p. 75. ^ "Ruiny zamku". Ruins of the castle (in Polish). www.tykocin.hg.pl. Retrieved 12 September 2010. ^ a b c d Stanisław Cynarski (1988). Zygmunt August (Sigismund Augustus) (in Polish). National Ossoliński Institute. pp. 198–199. ISBN 83-04-02670-8. ^ Margaret Odrowaz-Sypniewska. "Poland's Crowns". www.angelfire.com. Retrieved 16 February 2009. ^ a b Michał Rożek (1987). Polskie koronacje i korony (Polish coronations and crowns) (in Polish). p. 80. ISBN 83-03-01914-7. ^ Michał Lisiński. "Polonica w Szwecji". Polish mementos in Sweden (in Polish). www.zwoje-scrolls.com. Retrieved 12 September 2010. ^ Tadeusz Wojnowski (1988). A Polish American's guide to Poland. Interpress Publishers. p. 98. ISBN 83-223-1978-9. Wikimedia Commons has media related to Sigismund II Augustus of Poland.